I believed in the existence of other and more vivid kinds of goodness, and what I believed in I wished to behold. I keep underestimating my connection with this novel; for some reason, with every reread I tell myself to temper my expectations, to understand and be ready for the eventuality that I might not just love it this time around. Bewilderingly, I loved it at 9—and then again deep into teenagerdom (and twice at that), and then again (and most memorably to me) a couple of years ago. 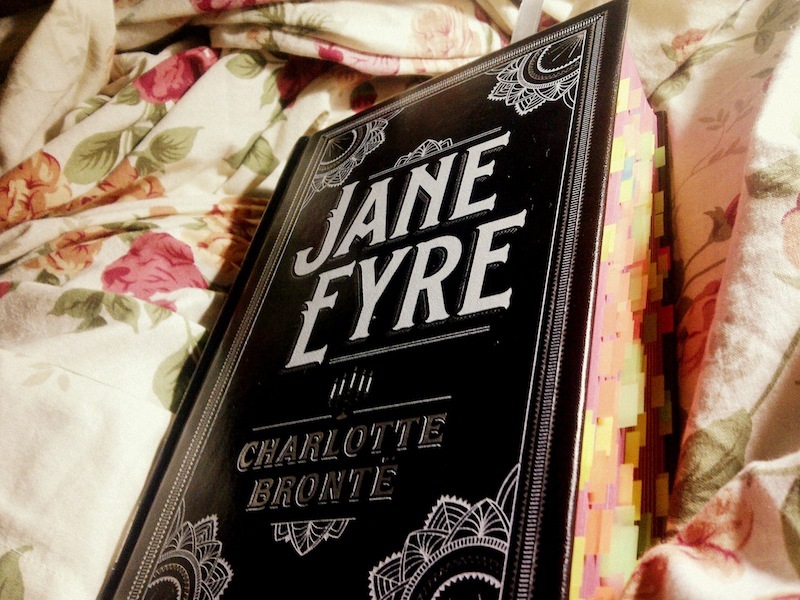 It was that last reread that should have clued me in: Jane Eyre is the book I have always loved the longest. Whatever variables there may be—that every time I return to it, with something in me having changed in the interim, something else within the book changes, too—I will always love Jane Eyre. Kerry’s SeptembEyre was the excuse I hadn’t realized I needed, to push me back into Brontë’s world. I started the book with the aforementioned trepidation, and as I should have known: The anxiety was all for naught. I finished rereading Jane Eyre almost two weeks ago—after a two before-bedtime marathons that surprised even me—and I’m still overwhelmed about the experience. I’ve been glancing at the book now on my dresser, looking at the flags that festoon its pages, and I just shake my head. So good. So mine. Then take my word for it,—I am not a villain: you are not to suppose that—not to attribute to me any such bad eminence; but, owing, I verily believe, rather to circumstances than to my natural bent, I am a trite commonplace sinner, hackneyed in all the poor petty dissipations with which the rich and worthless try to put on life. My hopes were all dead—struck with a subtle doom, such as, in one night, fell on all the first-born in the land of Egypt. I looked on my cherished wishes, yesterday so blooming and glowing; they lay stark, chill, livid corpses that could never revive. I looked at my love: that feeling which was my master’s—which he had created; it shivered in my heart, like a suffering child in a cold cradle; sickness and anguish had seized it; it could not seek Mr. Rochester’s arms—it could not derive warmth from his breast. —and then straightens that spine of hers, brushes her skirts off, and gives herself a good dressing-down. Look Rochester in the eye when you have to, ignore him altogether if need be—but always, always, hold on to what makes you you. It is madness in all women to let a secret love kindle within them, which, if unreturned and unknown, must devour the life that feeds it; and, if discovered and responded to, must lead, ignis-fatus-like, into miry wilds whence there is no extrication. [Rochester demanding, pleading: “Just this promise—‘I will be yours, Mr. Rochester.’” And Jane, so small, saying: Mr. Rochester, I will not be yours. Oh, my heart.] As far as I can remember, I’ve never seriously considered myself a Jane Eyre. (My identification with the hapless and rather unfortunate Madame Bovary has been well-documented, haha.) I could only aspire to be dear Janet. I am her, sometimes. I try to be, without me knowing it. I try to be, I do. But I am not, can’t ever be fully, a Jane Eyre. And she left him. She stole away in the dead of night. She left. When I closed the book, it was as if I’d been cut adrift. Having been submerged so intensely in Charlotte Brontë—to have cared, again, and always so immensely, for Jane Eyre and Mr. Rochester—to have realized something about myself and about the small, still Janet—and then having to return to the real world. Returning to the real world and my mind realigning to look upon landscapes as stormy moors, to look upon clusterfucks as madwomen in my attic. To spy Blanche Ingrams and Mrs. Reeds and St. Johns and scolding my brain whenever it strays towards what Rochesters this world has to offer. And to look upon that book now closed and replaced on the bedside table, waiting for the next time I’ll read it again as though it were the first time, as though it was just another marker in this long-and-longest bibliophiliac constancy. This is beautiful. Have you ever read that biography of the family? The father in his early days,the first woman he wooed, then their mother, her death, all the children, the terrible boarding school, the closeness of the ones still living. I am reading Bataille’s chapter on Emily in his book Literature and Evil. So it seems like a perfect time for me that you have written this. I have things to say about this family. Thank you! I haven’t yet, although the much-lauded historical fiction on them, The Taste of Sorrow, is right on my desk. Which book are you referring to, so I can hunt it down? I haven’t yet! I took a peek at it a long time ago, realized that it was Rochester-haterating, and my mom said, “Put it back on the shelf.” Hahaha. I’ll be picking it up soon, because I like to think I’ve grown up since then. I love Jane Eyre. I still think she is one of the few female protagonists who is really strong inside and who knows who she is – it’s a rare thing. I only really appreciated this when I re-read the book as a twenty-something. I loved the book too! She is definitely one of my favorite female protagonists ever, losing only to Jane Austen’s heroines. I’d love to read your reviews on Jane Austen’s works!